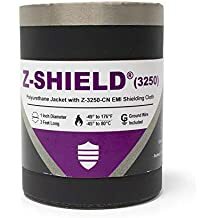 Shrink N Shield 7200 - Emi Jackets And Expandable Sleeves - Emi Shielding - Products - ZT | Zippertubing Co.
A Non-Magnetic, Halogen-Free, Hypoallergenic, Conductive EMI-Shielded Cloth, within a 2:1 Polyolefin Heat Shrink Tubing. 0.125" 0.1875" 0.25" 0.375" 0.5" 0.75" 1.0" 1.5"
Shrink-N-Shield® (7200) combines two proven technologies into a single, easy-to-install product for adding EMI protection to smaller wire and cable bundles. This particular product is the perfect solution for those who require a certain criteria to install an EMI shielding. If you require a non-magnetic, halogen-free or hypoallergenic EMI shielding solution than you have found the right product for your specific needs. 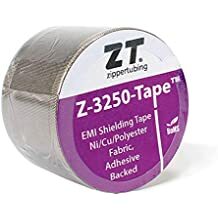 Zippertubing&apos;s Z-7200 EMI-shielding fabric is a .005-inch thick, woven, copper-plated nylon, rip-stop material with a proprietary silver-colored, non-magnetic, corrosion-resistant top coating. The material is extremely useful in EMI hardening components of sensitive equipment that are easily upset by nearby magnetic materials and has shielding attenuation levels that average 60 dB from 10MHz to 18GHz. By utilizing a polyolefin heat-shrink tubing the product is self-extinguishing, has excellent fluid resistance is RoHS compliant and offers Mil-Spec SAE-AMS-DTL-23053/5. Diameter Before Shrinkage 0.125" 0.1875" 0.25" 0.375" 0.5" 0.75" 1.0" 1.5"
A solvent based liquid adhesive with high initial tack, good adhesion to low surface energy plastic materials and dries quickly. Used for bonding EMI shielding cloth to plastic and heat shrinkable tubing.